Congratulations to the winner of this giveaway, Kerrie. Did you know that October is National Breast Cancer awareness month. 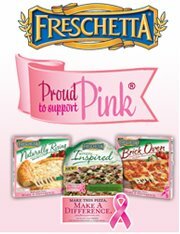 In honor of this occasion, Freschetta Pizza is Proud to Support Pink. Starting September 25th through October 31st any time you purchase a specially marked package of Freschetta pizza or Artisan Pizza crusts, you will be help Freschetta reach their goal of a $50,000 donation to the Memorial Sloan-Kettering Cancer Center. On special marked packages there will be a code that you can enter on the Proud to Support Pink website. For each code entered, Freschetta will donate $1 to the center. But that is not all. The code will enter you to win 1 of 50 Pink iPod Shuffles. Winners will be announced every week in October. And Freschetta will donate 50 pink iPod shuffles each week in October to 4 cancer centers around America. Hopefully making treatment for breast cancer patients a little more bearable with some great tunes. You can also score a $1 off Freschetta pizza coupon. Win It: One lucky Yellow Tennessee reader will win a coupon good for any Freschetta pizza and 2 pairs of Support the Pink earbuds. Mandatory Entry: Leave me a comment telling me you want to win. Entrants 18 and older and from the US are eligible. Contest Ends on October 26, 2011. Winners will be chosen by And The Winner Is and announced around October 27th. Winners will be notified by email with “You Have Won the Freschetta Giveaway” in the subject line. Winner will then have 48 hours to respond before a new winner is chosen.